The rocks are igneous intrusive rocks called syenite. The fluorescent mineral is sodalite. Sodalite (Na4Al3Si3O12Cl) is one of several feldspathoid minerals that form in sodium-rich magmas that contain so little silicon and aluminum that quartz and feldspar are absent. Nepheline, leucite, nosean, hauyne, lazurite, and cancrinite are other feldspathoids you may have heard of. Although relatively rare compared to granite and other silica-rich igneous rocks, feldspathoid-bearing syenites are found in the interior regions of all the world’s continents. Because the fluorescent stones were first recognized on the beaches of the Upper Peninsula, they were attributed the local name “yooperlites”, a yooper is a native of the UP. These stones, are however, not native to the UP, nor is their occurrence restricted to the beaches of the Upper Peninsula, so I personally prefer to give them a name more aligned with their geologic origin. I have acquired a handful through a box exchange with a collector from Duluth, MN and I am labeling them as sodalite-bearing syenite. 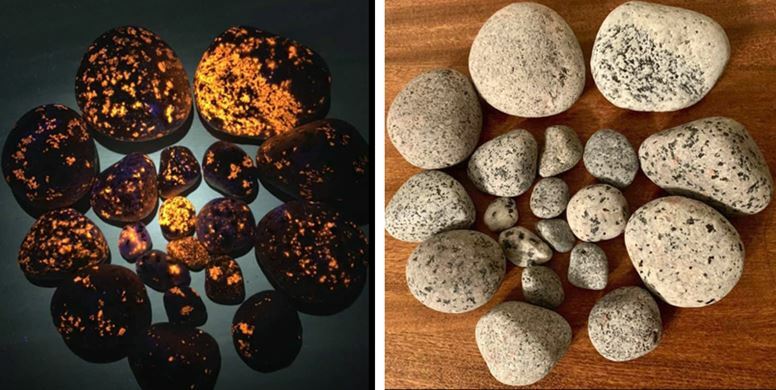 They were collected at Little Girl’s Beach in Ironwood, MN, so “yooperlite” is not particularly appropriate for my small collection. They neither originated nor were found on an Upper Peninsula Michigan beach. So where did they come from? There is no known source of sodalite-bearing syenite in Michigan. Rather, it is speculated that they originated from one of several alkaline intrusive bodies in Ontario, north of Lake Superior and then were transported south during continental glaciation. The most likely source candidate is the Coldwell Complex near Marathon, Ontario where fluorescent sodalite has been noted (Sage and Watkinson, 1995). In fact those authors note a roadcut along Highway 17 (Transcanadian Highway) where “hackmannite (fluorescent variety of sodalite) occurs in outcrops of amphibole syenite”. A geology field trip in 1995 stopped at this roadcut. The Coldwell Complex fits geographically and the mineralogy/texture of the rocks is similar. It is also the largest known alkaline igneous complex in North America. It is also possible that the source is an alkali complex completely submerged under Lake Superior. 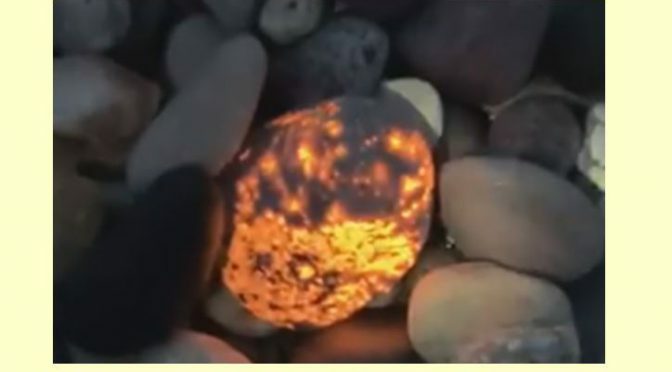 Interestingly there is a large gravity anomaly beneath the lake north of the region of Michigan where the fluorescent rocks are most common that is consistent with a region of alkaline igneous rocks (Shannon Zurevinski, Geology Professor, Lakehead University, Facebook communication, Dec. 2018). If they were indeed part of the large volume of rock excavated by glaciers to form the basin this might explain their relatively common occurrence in the beach rocks today. Regardless of their origin, they offer a new collecting option in a rock hounding region already replete with interesting rocks. “Ordinary” rocks by day, colorful by night (under LW UV light). This was the best combined photo I could find depicting the recent finds. Karin Robinson, a member of the Great Lakes Rocks and Minerals Facebook Group posted these. She reported finding them on Boxing Day evening (12/26/2018) on Lake Michigan near Racine, Wisconsin (i.e. not from the UP of MI). The biggest one is 3” across. Mitchell, R. H., and Platt, R. G., 1982, Mineralogy and Petrology of Nepheline Syenites from the Coldwell Alkaline Complex, Ontario, Canada, Journal of Petrology, V. 23, #2, p. 186-214. Previous PostMorrisoniteNext PostKaleidoscope Jasper, or is it?